Samsung Guru Power E2370 GSM Mobile handset is a stylish bar shaped phone with sleek looks. 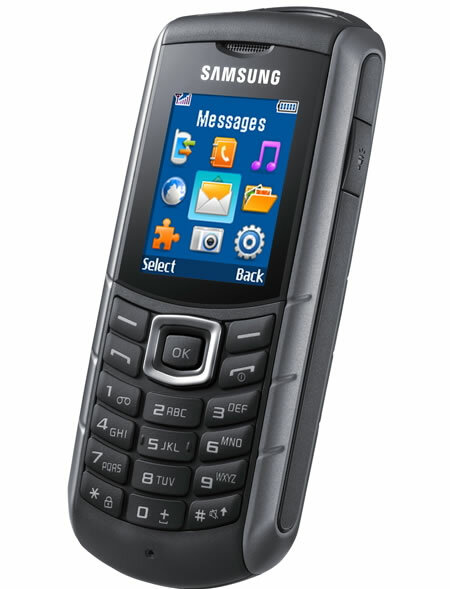 Samsung Guru Power E2370 is an entry level rugged mobile phone which is IP54 certified. Samsung Guru Power E2370 is dust, shock and splash resistant. Samsung Guru Power E2370 GSM Mobile handset supports a 1.8-inch display screen with 128x 160 pixels resolution and has Expandable memory up to 2GB using MicroSD. The new Samsung Guru Power E2370 GSM Mobile handset supports GPRS, EDGE, Bluetooth and USB connectivity. Samsung Guru Power E2370 features a VGA camera with video recording and 4x digital zoom. It also has a mobile tracker, stereo FM Radio with RDS, powerful dual speakers, 5 MB of internal memory, flash light, and music player. The Samsung Guru Power E2370 is a budget phone with great features. The Samsung Guru Power E2370 GSM Mobile handset has an extra long battery life of 22 hours and standby time up to 67 days with 2000 mAh battery for long battery. Samsung Guru Power E2370 GSM Mobile handset is targeted towards budget consumers as well as frequent travelers. Samsung Guru Power E2370 Price: Samsung Guru Power E2370 is priced at Rs. 3600 approx in India.